Fixing 4xx errors is an important part of SEO and a job all SEO's should be doing, we will look at how this is done with Screaming Frog. Broken links are bad news, this is awful for not only users but also bots. This will impact your SEO and cost you traffic. Links that don’t work need to be fixed by finding them, replacing the link with the URL that should be there or setting up 301 redirects to redirect the user and bot to the new location of that content. There are several ways to find broken links, but the easiest way is Screaming Frog which is a software that mimics Googlebot (and other bots) and lets you crawl your website as a search engine. This highlights any errors like broken links and makes it easy to locate such errors. Broken links are common in user submitted content, site migrations, old websites, platform migrations or content used from other sources you may have borrowed. They are a natural part of the web, but it’s best they are tidied up. 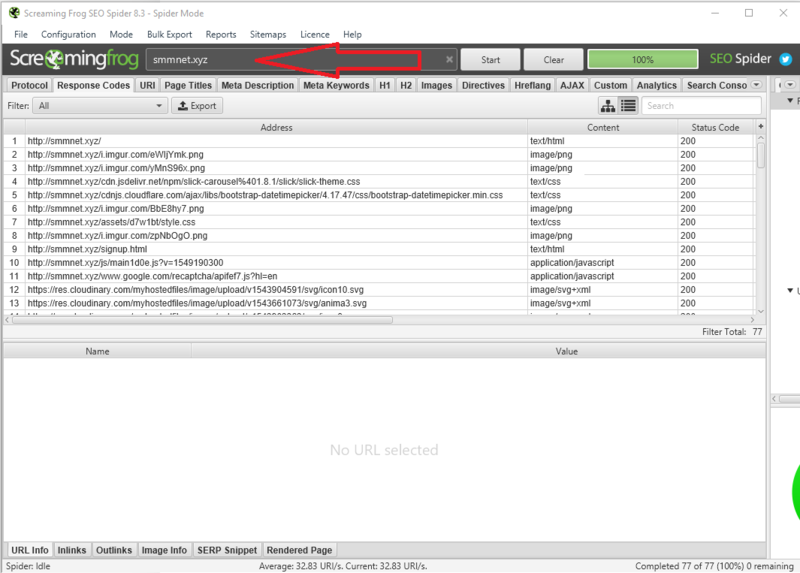 Here is how you find broken links in Screaming Frog. I’m assuming you’ve downloaded and installed Screaming Frog, open it up. You’re going to need to run a scan, enter your website into the URL box and click start. Let it complete the scan, for larger websites this can take some time. 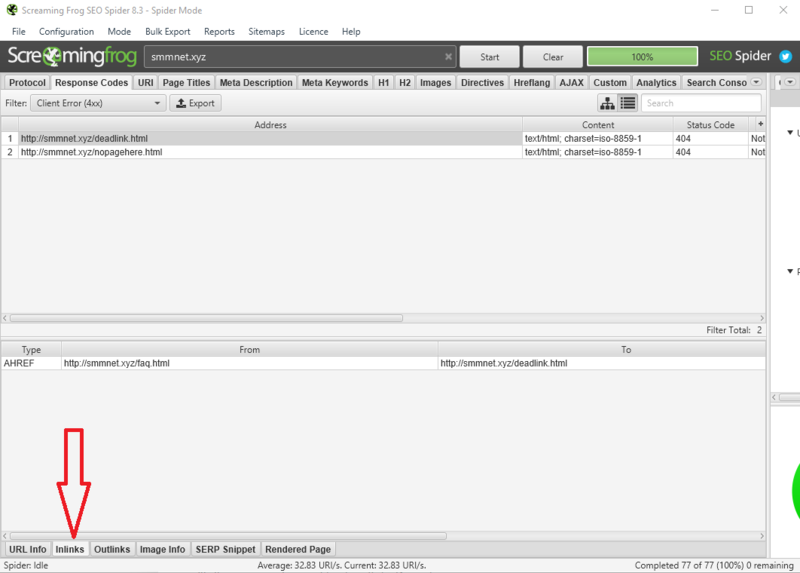 Screaming Frog features a dedicated tab for response codes, which is what we need when looking for dead links. Once the scan is complete navigate to it. Within this screen we have a filter option, select “Client Error (4xx)”, this will show you only the dead/broken links from your scan. Screaming Frog has found the URLs which need to be fixed (through a 301, replacing the link or creating a page at these locations) but that’s not so useful, really to make the decision on what you should do you need to know the location of these broken links. To see the location of the error, select the one you want to fix and click the “Inlinks” tab at the bottom. 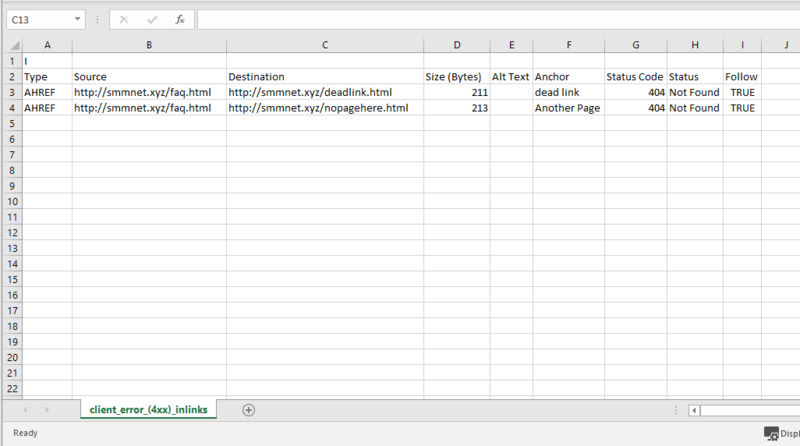 This will give you the location of the page(s) that each of these 4xx pages were found on. From here you can fix as you need to, however if you have 100’s of errors that you need to fix clicking on each one can be tedious. You can export the report to show you 4xx errors on a spreadsheet which might be easier for you to organise and mark things as fixed. To do this head to “Bulk Export” > “Response Codes” > “Client Error (4xx) Inlinks”. From here you can fix everything you need. 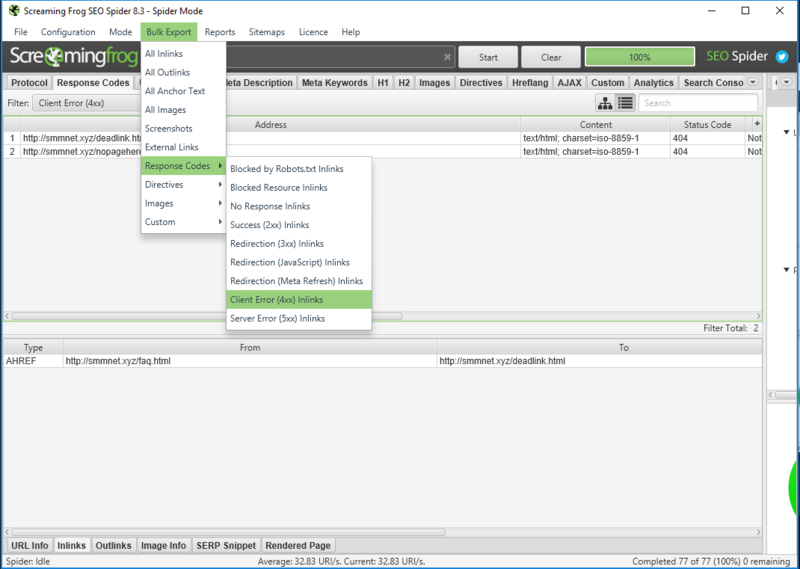 Now you have (hopefully) tidied up all your bugs and fixed all those broken links, you can re-scan your website in Screaming Frog to be sure that everything is sorted. If your website is small and can be scanned in a short amount of time you can just rescan as you did in step 1 and make sure all these errors have been fixed. 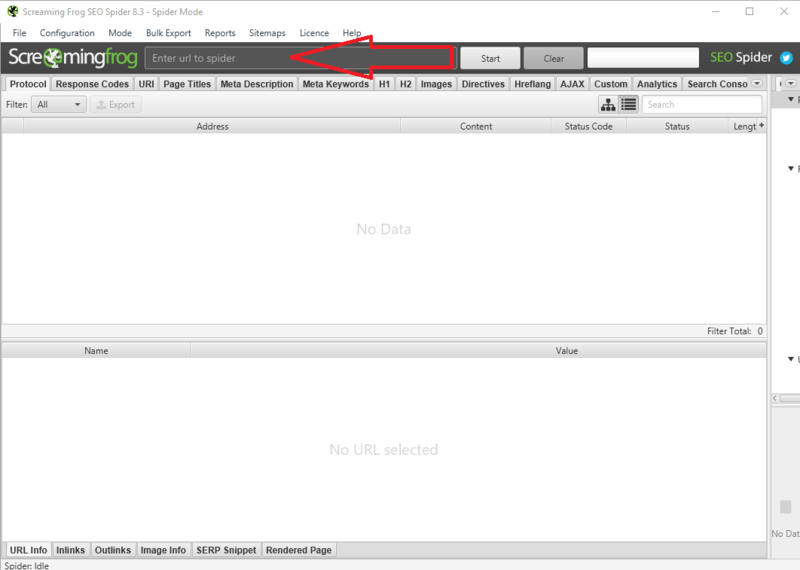 Screaming Frog has a mode which can help people with larger websites, it’s called list mode where rather than spider your website like a bot you provide it with a list of URL’s and it will only scan these. To use this get a list of pages that had 4xx errors in them from the original scan, this is best done from the export in the last step. Head to the main menu, and click “Mode” > “List”. From here paste in your URL’s and let the scan run.